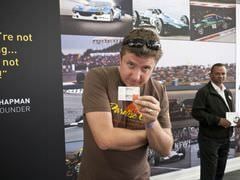 You’ll be aware by now that a group of 11 Sidepodcast commenters headed into the soggy depths of the Ardenne Forest last weekend to experience the remarkable 2010 Belgian Grand Prix. Even though only a small section of our community actually made the trip to Belgium we tried our best to take the site with us, checking the comments and sending twitpics as often as we could. 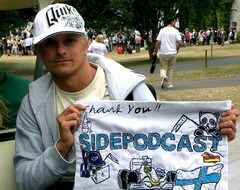 We were of course representing the site while on our holiday, and so to celebrate this I made a larger version of the original Sidepodcast banner. 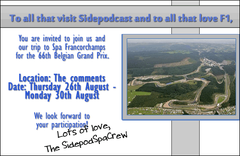 As Formula 1 begins to wake up from its long summer slumber, a group of Sidepodcast commenter's from all over the world are beginning to prepare for our trip to next week’s Belgian Grand Prix. If you’ve been around the comments over the last couple of months you’ll no doubt have seen mentions of plans and our excitement. However we’re like a huge family here, and an official Sidepodcast trip wouldn't be the same without the comments. We’d miss you all too much. So while our group of 11 or so are away we’ll do our best with rural Belgian 3G and wifi to keep you all involved in the entire experience. 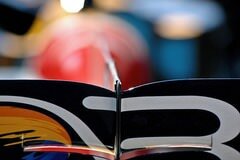 From our luxurious mobile homes to being trackside, we want you to be there too. Last weekend I was fortunate enough to find myself standing back at one of my favourite places. The Formula 1 paddock at the Goodwood Festival of Speed is always buzzing with action, be it F1 cars returning from a run up the hill or enthusiastic fans all crowding round to get a glimpse of the drivers and their stunning cars. This weekend has been something of a memorable one, we’ve had some great Tennis, Football and lovely weather. However I don’t want to talk about any of that – although it would be easy to talk about Lukeh’s sunburn! Instead I’m choosing to concentrate on something much more special. This weekend we were among many thousands of people lucky enough to descend on the glorious 3 day motorsport ‘garden party’ in the heart of Chichester. There is always plenty to keep you occupied and we certainly didn’t see it all, but it was a brilliant weekend. It's well known in Sidepodcircles that guest writer Lou is a fan of Brawn GP, and in particular a certain British driver for the team. Here she tells us about the recent competition she entered and subsequent joy at receiving a prize.